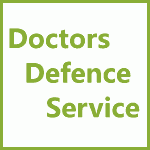 GMC / MPTS Fitness To Practise (FTP) Tribunal Hearing Representation | Doctors Defence Service – UK. Doctors Defence Service (DDS) defends doctors before the General Medical Council (GMC) / Medical Practitioners Tribunal Service (MPTS) in all fitness to practise hearings, interim orders hearings, restoration hearings, and registration law hearings. A doctor who is referred to a General Medical Council fitness to practise hearing has a number of procedural stages to prepare for. A GMC / MPTS Fitness to Practise (FTP) hearing has four principle matters to determine: 1) Facts; 2) Misconduct / Deficient Performance / Health; 3) Impairment; 4) Sanction. Doctors can potentially influence the outcome of their FTP case by presenting quality evidence, strong legal argument, and oral and written submissions at each stage of the hearing. Those doctors who prepare well, in advance of their FTP hearing, usually fare better than those who leave preparation to the last minute, in our experience over many years. We would therefore encourage doctors to seek legal advice at an early stage, so that full preparation can be undertaken, even if they choose to represent themselves at a later stage or use our services for just parts of their case. Where a doctor denies the factual allegations, as set out in the GMC Charges, the GMC case presenter will call witnesses and present documentary evidence so as to prove the case against the doctor. The doctor may give evidence and call witnesses in their defence. Either or both sides may call expert witness evidence, in prescribed circumstances. The doctor and the GMC also has a right to question witnesses called by the other side. The FTP panel determines where the truth lies on the balance of probabilities. That is the civil standard of proof. The criminal standard of proof (‘beyond reasonable doubt’), which used to be applied in GMC cases, is no longer used. The standard of proof ‘threshold’ for proving a case is therefore now lower than it once was, making it easier for the GMC to prove its case against a doctor. The GMC needs only to prove the case on the balance of probabilities (“which explanation is more probable”) to a threshold of 51% or more. The GMC may also rely on hearsay, in certain circumstances, rather than call a witness but that will depend on the overall impact on the fairness of the proceedings to the doctor, who is entitled to a fair trial at common law and under Article 6. The other stages of the GMC FTP hearing are a matter of judgment for the panel that is considering the case, rather than on the balance of probabilities. Evidence can be called at the misconduct / deficient performance / health; impairment; and sanction stages of the hearing. Submissions and legal argument can also be made. The panel might find at any stage that the case brought by the GMC is not made out (not substantiated). Not all factual allegations, even if proved, constitute misconduct or deficient performance. If the case against the doctor is not proved at any stage of the proceedings the case will be closed. The code of conduct for doctors Good Medical Practice is used by the GMC and MPT panels to assess whether a doctor has fallen below the standards expected of a doctor. In relation to medicines, the GMC’s guidance Good Practice in Prescribing and Managing Medicines and Devices (2013) will be used by the tribunal to assess whether a doctor has fallen below the standards set out therein. There is also other guidance and ethical guidance that will be considered. At the Impairment Stage the panel asks “Is the doctor’s fitness to practise currently impaired?”. Where a panel determines that the doctor’s fitness the practise is not impaired, they may still impose a GMC Warning, which sits on a doctors registration for a period of five years from the date it is imposed. [Previous warnings may also be taken into account by the panel, when determining whether a doctor’s fitness to practise is impaired.] The panel will consider the seriousness of the factual findings and look at whether the doctor has remediated their shortcomings, overcome any illness, shown sufficient remorse and insight, and whether there is a public interest in finding impairment. If the FTP panel determines that the fitness to practise is impaired, the case will move to the sanction stage. As an alternative to imposing a sanction, the GMC/MPTS might agree to close the doctor’s case by way of undertakings. See our article on GMC Undertakings for further information. At the Sanction Stage, the GMC MPTS panel may impose a sanction of: Conditions (restrictions), Suspension, Erasure, or make no order. Where a sanction of conditions or suspension is imposed, a Review Hearing will usually be convened at a later date. The GMC FTP panel will make reference (and bear in mind) the Indicative Sanctions Guidance, and various annexes, when determining the sanction to impose. The sanction must be proportionate and just bearing in mind the doctor’s position, and the public’s right to expect high standards of practice from doctors. The doctor or their representative will need to make persuasive submissions on the indicative sanctions guidance and where the particular doctor’s case falls within the spectrum of seriousness, and the relevance of any mitigation, remediation and learning. Future risk of repetition will also be a focus of the panel’s decision making process. A doctor’s level of insight is also of crucial importance. Doctors who are planning to return to work after a period of suspension should bear in mind the recommendations of the Academy of Medical Royal Colleges (AMRC), set out in their publication (May 2012): AMRC Return to Practice Guidance. Where the panel imposes a sanction, the panel will be required to consider whether to make an immediate order, to cover the appeal period set out in the statute (the Medical Act 1983, as amended). In many cases it is appropriate for a doctor to oppose the imposition of an immediate order. Also download a copy of our GMC FTP Hearing Procedural Flowchart (in pdf format) – a simple diagram which explains the various stages of a GMC FTP hearing in a simple flowchart format. Doctors should observe that hearings do not always go to plan. 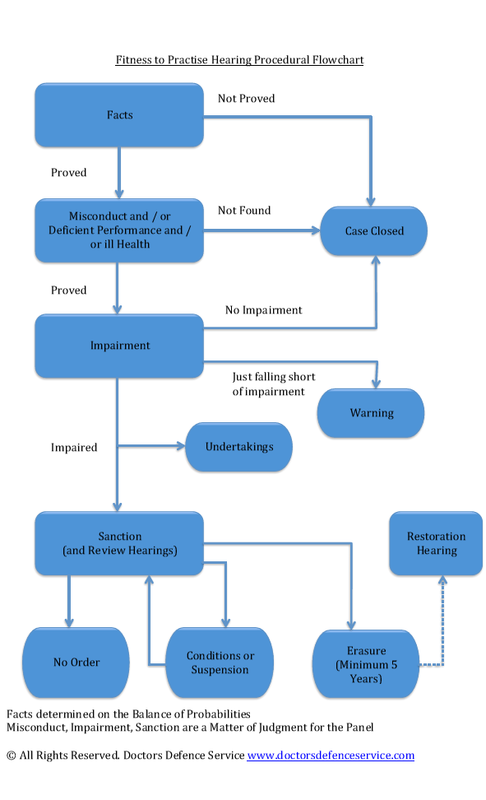 There can be unforeseen events, such as equipment failure, the illness of a witness or court officer, a delay in the hearing starting due to the late arrival or unavailability of a witness on a particular day. The list is endless. In some cases a witness might be questioned for longer than anticipated, having a knock on effect to the witness timetable. Witnesses might therefore lose their ‘slot’ to give evidence, as might the doctor facing proceedings. Doctors should take this into account when arranging their own and their witnesses’ attendance at a MPTS hearing. Some doctors panic about the impact of a GMC case on their own reputation or of losing their case to such a degree that it deleteriously affects their judgement. Some doctors have been found to have created false documents to bolster their defence, or to cover up their shortcomings. Such conduct can be fatal to their case, if discovered, which it usually is within the forensic process of a tribunal hearing. Of course, a doctor should never invent evidence in support of their defence case. To do so would be contrary to the GMC code of conduct and could constitute perjury (lying on oath), which in turn carries penalties. Doctors should always be truthful in their dealings with the GMC and MPTS. To do otherwise risks their registration. Matters concerning a doctors health will be kept confidential by the GMC. Any determination made in public will not make express references to a doctor’s health. Further, the FTP panel can go into private session, so that the press and public are excluded for that element of oral evidence and the delivery of any judgment on the case, relating to health. Publication of GMC MPTS FTP Decisions: The GMC will publish decisions in the on-line List of Registered Medical Practitioners, in accordance with its policy: GMC Publication and Disclosure Policy (GMC Publication) (in pdf). FTP determinations are usually accessible to the public via the website that allows them to check a doctor’s registration status. The policy (in 2015) sets out that the determination will be permanently accessble to the public. Appeals: A doctor who is dissatisfied with the outcome of a GMC / MPTS FTP hearing can, in certain circumstances, appeal the GMC / MPTS FTP panel’s decision, if the decision was wrong or there was a serious procedural irregularity. View our Appeals page for more details. For more information about the services that DDS provides to doctors, browse this website or call us to discuss any GMC / MPTS related legal matter. We will discuss with you without commitment how DDS might be able to advise or represent you in relation to any GMC matter. Our lawyers regularly defend doctors before the General Medical Council and will be happy to assist you. Call 0800 10 88 739 for more details of the legal services that we provide. See our other GMC Representation pages. Alternatively, use our search box at the top of the page.